Across centuries, people have migrated to flee war, hunger, unrelenting poverty, and political oppression, to seek asylum, or seek a better quality of life. Migration is not a new phenomenon. Today, we are witnesses to massive amounts of death and suffering of migrants. The Mediterranean Sea is becoming a huge cemetery; children are separated from their families when crossing the US border, and their parents treated as criminals. The rapidly–changing political climate in many countries with proposals and projects that previously seemed against the law, human rights obligations and international conventions, has a strong impact on political culture on a global scale, promote fear, mistrust, xenophobia, racism, exclusion, deportation and fuels systems of corruption and war. I feel particularly concerned, coming from a country where people destroyed a wall more than 20 years ago but where the dominating political discourse ridiculizes a ”welcome policy”, where hate speeches have now reached the parliament not just the streets and this happens in all our neighbouring countries. New walls, new deals, new Marshall plans combined with military securitisation in Northern Africa – forgetting about UNSCR1325 and needs of women for a sustainable future and eventually their active role in anti-terror measures. This phenomenon that we experience needs courageous answers from Civil Society, of political decision makers who have not forgotten their humanity – on a national level but specifically on a transnational level – such as the OSCE. The debate on migration must strengthen a cross-dimensional approach. Numerous studies and individual as well as collective well documented experiences confirm that migration affects women in a particular way in the whole cycle. And often the challenges are inter-linked. Feminisation of poverty and increasing inequalities due to multiple crisis (including lack of access to resources, education, independent living, safe sexual and reproductive health services, abortion). We see intersecting vulnerabilities, sexual and economic exploitation, promotion of a dominant and toxic patriarchal lens, discrimination and militarised securitisation. There is a strong tendency of de-gendering political debates with a visible backlash on“traditional values” (a major problem in Central and Eastern Europe) and as consequence re-victimisation of women. While entire communities suffer the impact of armed conflict, women and girls are often the first to lose their rights to education, to political participation and to livelihoods; out of desperation and seeking a better life for their children, are often the first to emigrate – but often reach only neighbouring countries where they remain in difficult situation in big refugee camps with all dangers of being re-traumatised. On the move, women are exposed to specific threats such as forced marriages, all forms of SGBV, forced prostitution and trafficking, brutalised by armed groups, human traffickers or even border security forces, challenges faced by the service providers in Asylum/Transit/Reception Centres, lack of participation in finding creative solutions, lack of money and exposure to corruption. Sometimes they suffer of the separation and losses of family and children. The current international job market requires more female labour, but there are no regulations, no security guarantees and no medical programs for such women. Women-refugees have no special centres where they can learn language and receive skills. They are isolated and under the influence of their diaspora. It means that children also will grow in such conditions. Greater awareness raising through lobbying for a gender-sensitive conflict analysis and the consequent implementation of the WPS Agenda in research, monitoring mechanisms and advocacy as a way to prevent violence and war. Greater attention for priority to Prevention, a comprehensive approach on Human Security aspects,women’s rights and feminist economics – in this combination. 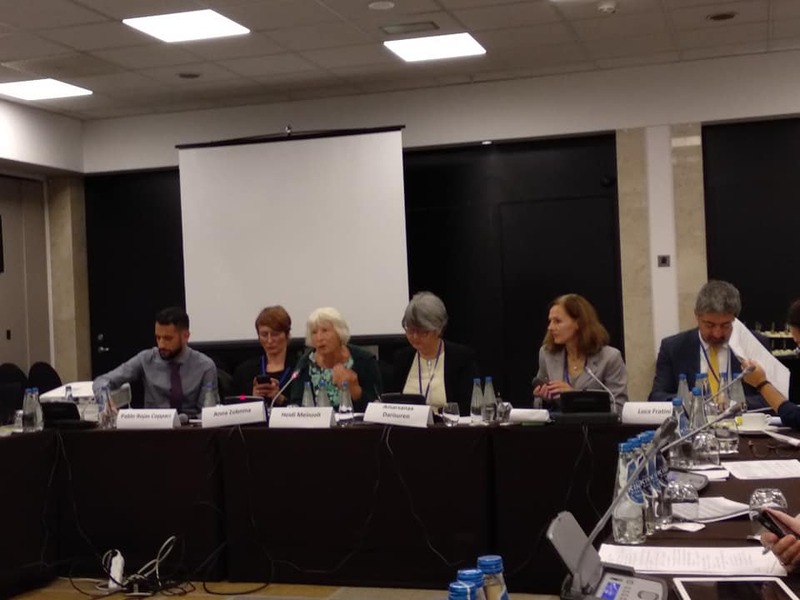 NGOs addressing chances and deficits of NAPs for the implementation of UNSCR 1325 focussing on more than security issues, particularly issues of refugee women and IDP women (internal migration in the OSCE region is difficult to make visible in the shadow of external migration!). (In Georgia the third NAP currently has a provision for studying psychic health of IDPs and conflict affected women, as well as is special quota for livelihoods projects for IDP women in the Livelihoods Development agency. Still funds are insufficient). Armenia has hosted 25 .000 refugees from Syria and is organizing comprehensive programs related to integration and successful placement in houses. There are many programs specifically addressing women needs; training on life skills, job skills taking into consideration market demands, language, law, counter trafficking. Cooperation in Central Asia with networks and organisations such as the Committee on Migrants Workersand with the “Central Asia on the Move” platform. Rescue and CS commitment in the spirit of welcome and safeguard of human values in many European countries, often in contraposition to their political leaders. All recommendations combine always Protection of women with their meaningful Participation! Fight the root causes of forced migration with “moving the money from war to peace”, decrease military budgets and invest in infrastructure (schools, hospitals, roads), regenerate depleted forests, ensure provision of water in the communities, etc. Women will be agents of change. Provide open safe and legal asylum routes, in order to counter smuggling networks and to increasingly enable women, children, the elderly and people with disabilities to seek refuge without risking their lives. Ensure and strengthen a gender-sensitive conflict analysis and perspectives when establishing a complaint mechanism, (eg within the office of the Frontex Fundamental Rights officer in case of human rights violations committed by Frontex, Member States and officers of third countries when cooperating with Frontex). Sign and ratify the Istanbul Convention on preventing and combating violence against women and domestic violence, which requires states parties to interpret the Refugee Convention grounds in a gender-sensitive way and to provide gender-sensitive reception conditions, support services and asylum procedures. In recent years as part of austerity programmes and lack of funding may discourage legal representatives from taking complex gender-related cases. Take measures to ensure that all forms of violence against women and state-sanctioned gender discrimination be recognised as a form of persecution and that victims can thus avail themselves of the protection offered by the 1951 Convention relating to the Status of Refugees, in line with Article 60 of the Istanbul Convention, and should be valid reasons for seeking asylum in the EU. In the health care system, in regards to psychosocial approach, the focus on SGBV should be reinforced by a pool of professionals with expertise in the psychosocial approach. Capacity development needs enough funding, and it should be more specialized and focussed. Specialized training for local legal advisors in SGBV-relevant laws. Another possibility is the establishment of a “Law Clinic” with specialized counselling for survivors of SGBV and other traumatic experiences. Encourage all countries which have insufficient Immigration policies – including legal access possibilities to improve their provisions for the Prevention of further conflicts. Support legal advocacy to accompany refugees in actions to stop and demand accountability for rights violations.